« Real's Rhapsody enters App Store submission hell, could bode well for Spotify? Why the world’s largest mobile phone maker would enter the crowded and low margin market of Netbooks, when it should be focusing on how to restore its lead in the much higher margin ‘smartphone’ category, is a very good question. The answer, however, is simple. Here in the UK, we lead the way in the carrier-subsidy merry-go-round where Nokia does very well indeed out of the whole facade. The story goes something like this. Consumers sign up to an 18 month mobile contract paying, say, £35 per month (approx $57), and with it they get a ‘free’ and potentially high end smartphone. Of course, it’s not really free but much more akin to a ‘hire purchase’ whereby they’re paying for the device over the course of the 18 month contract. Then, once the contract is up, the carrier entices the consumer to sign on for a further 18 months in return for another shiny new phone, which once again the consumer is actually paying for, even if at a discount thanks to the negotiating ability of the carrier and economics of scale from the handset maker’s point of view. Ask yourself this: name one other piece of consumer tech that ‘average’ consumers are persuaded to replace, almost without question, on an 18 (or 24 monthly) basis? It doesn’t happen with TVs, DVD or Blu-ray players, audio systems (iPods apart but that’s a different story i.e. poor build quality, brilliant marketing and non user replaceable batteries). And it certainly doesn’t happen with PCs. Until now. Enter the carrier-subsidised Netbook. Every mobile carrier in the UK offers one of these, and so do PC World and independent mobile phone retailers on the high street, such as the almighty Carphone Warehouse. And Nokia has some of the best carrier relations and brand recognition outside of the U.S.
Why wouldn’t it want a piece of the Netbook action? 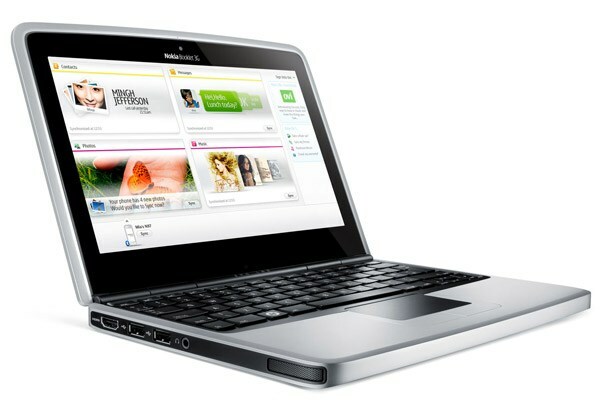 On that note, Nokia’s mini-laptop, dubbed the Booklet 3G, will offer built in 3G connectivity, GPS and a hot-swappable mobile phone SIM card slot. Perfectly aligned for carrier subsidy. It’s also a relatively high end Netbook, so presumably the margins will be higher along with the price point compared with some of the most cheep ‘n’ cheerful offerings currently on the market. That of course won’t matter one bit if Nokia can persuade the carriers and retailers to take on enough stock, who in turn will persuade consumers to pay for their ‘free’ or ‘close to free’ PC over the course of their 18 or 24 month mobile broadband contract. That’s the brilliance of the carrier subsidy merry-go-round.